Sunderland on the other hand finally get the chance to seek some revenge after the Brewers managed to be the first team to defeat Jack Ross’s men in the league this season way back in September. With an automatic promotion spot tantalising close and the fact it was Nigel Clough’s side who condemned Sunderland to a second successive relegation last season, motivation should not be in short supply for tonight’s clash. Sunderland confirmed they were ready and rocking for the end of season run in by following up an emphatic win over Accrington Stanley with a determined and emotional victory at Rochdale, captain Honeyman scoring in the 89th minute to take all three points back to Wearside. Some players which have struggled for game time put their hands up to continue in the startling IX with McGeouch and marquee summer signing Charlie Wyke both having big impacts on the game. McGeouch has been particularly impressive in the last two games, seeming to have an extra half a second to make decisions, something his competitors don’t. He reads the game brilliantly and his offensive passing is simply marvellous to behold, it’s certainly no coincidence that Sunderland’s recently excellent attacking play has occurred with him in the team . 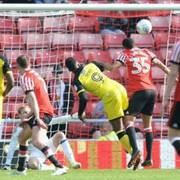 The aforementioned Wyke, the target man from Teesside, seems to be finally finding his feet in a red and white shirt. His physical presence as a focal point of attack is stretching defences and the likes of Will Grigg and George Honeyman are able to exploit the space that’s opened up as a result. He’s pretty nimble with the ball at his feet for a big man too, easily managing to occupy defenders while his team mates come up the pitch to support him. But most importantly the big No. 9 has managed to find his shooting boots, receiving the ball to turn and finish neatly in the bottom right hand corner of the net. A goal of some skill that will do his confidence no harm and I think Wyke is due a bit of good luck and form, hopefully his stop-start season can splutter into life at the perfect time for Jack Ross. The back four as always deserve plaudits for ensuring Rochdale didn’t get a second to follow up their first. Jack Baldwin seems reinvigorated following a spell out of the team and his partnership with Tom Flanagan appears to be maturing with the pair less prone to calamitous mishaps. If they continue to go about their business as astutely as they have of late then the unflappable Jon McLaughlin can expect to add to his clean sheet tally, and deservedly so. Burton are enjoying a real purple patch in their season, winning three out of their last four games and scoring goals for fun. They did us a favour by beating Barnsley 3-1, before that the Brewers absolutely smashed Accrington 5-2 and sent Blackpool home after giving them a 3-0 hiding. Next in their sights are the Black Cats and their recent record against Sunderland is good, winning the last two and Nigel Clough will be well aware that the double is on for his side.